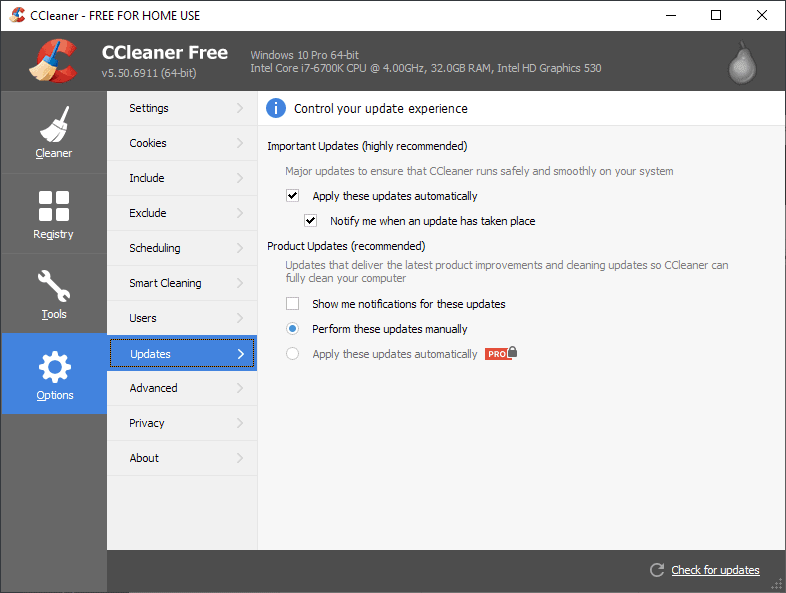 A new version of the file cleaning software CCleaner for Windows, version 5.50, features new options to control program updates. The year 2018 has not been a very pleasant one for Piriform, maker of CCleaner, and Avast, Piriform's parent company. The integration of Telemetry collection, first without clear options to disable it and turned on by default, and forced automatic updates to a new version of CCleaner, were two of the major blunders in that year. CCleaner 5.50 includes a new Updates menu under options in the program interface. It gives users control over the updating behavior of the program according to the release notes. CCleaner get control over important updates and project updates under the new Updates section. Piriform defines important updates as "major updates" that ensure "that CCleaner runs safely and smoothly" on the systems it is run on. Product updates on the other hand are defined as updates that "deliver the latest product improvements and cleaning updates". The forced automatic update in September 2018 would be classified as an important update while minor version updates that improve cleaning algorithms as a product update. Important updates are configured to download and install automatically. Users get notifications after the fact. Options are provided to disable the notification or the automatic installation of these updates. Product updates are applied manually only for free users. Pro users get an option to apply product updates automatically similarly to how important updates are processed by the software. The option to show notifications for new product updates is disabled by default; users who want information about new product versions may check the option to receive those on their devices. One cannot say that Piriform is not trying. The company introduced privacy options in the program after users complained about the new data collecting and the lack of options to turn Telemetry off. Now, after users complained that CCleaner would auto-update itself in September, options are introduced to control these updates in the program. The ride would have been a lot smoother for Piriform if the company would have introduced these options before it made the changes or pushed the automatic update to CCleaner installations. Now You: Do you still use CCleaner? Too late. Moved on to Glary. Is there still a portable version ? I use XTR Toolbox. Much better and it’s open source. The day Avast took over priform was the day I stopped using them. And I don’t have any faith the you can place some checkmarks. the obvious like updating will do their work but the telemetry ????? Piriform was decent prior to the sellout, the regcleaner is a NO, NO but is useful for tracking older uninstalled programs, then manually removing HKLM keys via regedit. Telemetry was easily killed in CCleaner via firewall rulesets but it’s gone beyond that. IMO CCleaner is now consigned to digital malware history along with anything Avast!/ AVG. Open Source alternatives are out there, such as Bleachbit with the winapp2 extension with no telemetry at all for Windows and Linux. To anyone wondering, the /AUTO flag is working again as of version 5.47. I have only tested the x64 version disconnected from the interne (I don’t use any firewall) and let it clean the clipboard, and it worked. Still with Piriform’s last version (5.32.6129). May look elsewhere eventually, but Avast, No thanks! Question: Why you decided not to use CCleaner? A:“Well it was the telemetry and the overall quality problems it had in the latest versions. These forced updates and opt-out feature previews, I didn’t experience, but learning about it reinforces my decision : I hate the trend of software that does what it wants and not what the user wants, especially for security / privacy-oriented software, it makes no sense. Same here. I downgraded back to 5.40.4611 after this debacle started and am perfectly happy with the results – especially since that version does not try to update itself. Cool, I’m still not using this trash anymore. I’m already using Wise’s products, they are pretty nice and when I submit feedback they actually reply and fix it. I had issue with Wise Program Uninstaller and I wrote to support, they answered within 12 hours every time and they even fixed my issue in the next update which was actually about a week from the correspondence. It was trash before, it’s trash now. Before it got bought by the virus spreading company AVAST, it had mediocre junk detection abilities. So you had to install System Ninja’s CCEnhancer tool that brought CCleaner a bit closer to the level of System Ninja and all normal junk cleaners. not to forget to check “certain” settings with each new ccleaner – build. one of the most underrated tools of its kind, which deserves more attention than ccleaner. be that as it may, of course i continue to give ccleaner a chance, but with caution and accepting some limitations. ps: “glary software” has to be handled with caution. imho. eset detected (in my case) after about 2 months “suspicious behavior” of their “software updater” app and blocked it. Kids, let me tell you a quick story. Back in the late 90s when TOP PCs had CPU of 400Mhz and 256Mb ram, utilities like this so called “CCleaner” where a must. You had to have it running weekly to ensure a clean and faster PC. Now, at this day and age, you only need such utility if you own a very very old computer. CCleaner is following the exact tracks of jv16 (https://www.macecraft.com/jv16-powertools/) from decades ago. At first it was “free”, then gone adware, now it is a full commercial app. The CCleaner is a brother with VLC: total useless piece, overrated just because they have a “cool” icon and have popular names. pfff… give me a break. I have 1 (thats correct: one!) single .bat file that clear all traces and junk files in my system. This .bat file I run once in a month. Such a fuss for a dummy program like ccleaner. Let it go! CCleaner has always been a commercial program. There has always been a free version and a paid-for version. Incidentally, there’s nothing wrong with paid-for software. Paying for something tends to mean there’s honesty involved on both sides. Huh? In all my life, I’ve never actually seen a correlation between the honesty involved in a transaction and whether or not that transaction involved money. But if there were some sort of correlation, I would expect that the involvement of money would reduce the honesty, not increase it. Seems pretty obvious to me. Facebook services are free, but then they pump up your private data and keep very silent about it. Microsoft gives out Windows 10 for free, and suddenly it’s a nightmare to users. On the other hand, I buy program X — hello Mister Customer, what can we do for you ? Here is some money for you, Mrs Amazon — how nice of you, you can return the product for free during one month, no questions asked. When two people exchange something for money, they agree beforehand on the price, meaning the transaction is beneficial to both of them. They also enjoy a degree of protection from the law — both of them. That’s basic economics. You accept free stuff — well, it could be given out of good faith and with no strings attached, but it could also be a lemon, a way to foist malware on you, steal your personal data, spam you with unwanted advertising, you name it. Yes, but I can come up with a lengthy list of thing people pay for that include all those nightmares as well, and I can come up with a lengthy list of free things that work very well and aren’t privacy (or other) nightmares. I remain unconvinced that there’s a correlation between money being involved in a transaction and the honestly of the transaction. They appear to be independent variables to me. If I understand correctly, there’s no way to have CCleaner warn you that an important update is available, and let you decide whether to install it ? It seems either you let Piriform install those by itself (and maybe ask for notification after the fact, as a big favor), or you can refuse them altogether, but then you get no warning at all, and you need to constantly check Piriform’s website just to be sure there hasn’t been an important update published. If that’s actually how it works, it looks very devious to me. @clairvaux ..all just suggestions : better, you disable these new settings (every _automatic update_ setting) and on top of that block the app via firewall (outbound rules/inbound rules). not to forget to opt – out: “help improve ccleaner by sending anonymous usage data”, under : options – privacy (even if the app is blocked via firewall). ccleaner cannot be trusted anymore. never again. but can still be used with caution! and only at the present time. who knows with what avast will come up with in the future. yep, avast – piriform no longer exists since the takeover. and this addresses certain “values”. the actual portable : https://www.ccleaner.com/ccleaner/builds (do a previous check per virus total and also directly on your system before and after the first start with mwb, adw and co. .
and if you want a better app, try privaZer – link in first post (or try “bleachbit” (which is too limited for me)). or leave all the cleanup work to windows. but if you rely on windows, you’re lost. again: imho. or ask “old wise daddy” anonymous in private quite friendly about his very personal techie – solution. I researched Privazer a while ago, and found a string of horror stories. People complaining it was way too aggressive, broke their computers, etc. That made me a little reluctant about trying it. @clairvaux ..most of the time, the cause of the error sits behind the computer. the “adapt privazer to your needs” option is – imho – to ignore. go to the “main menu” – “scan in depth” or choose only one option from the dropdown menu : if you coose “scan in depth”, click on “basic user” – see below in this post) : all 20 possible functions are explained in detail by clicking on it (left side). either a “learn more” menu is located on the right side or an extra “options menu” (where you can fine tune your settings _again_) or both. you have to take your time, learn to understand, choose what you need and not blindly just select everything and check “scan” + “start cleaning”. although there is nothing against a “scan” alone. you will get even more needed information. in addition there is also the above-mentioned “basic user” mode and an “advanced user” mode (next to the logo). the basic user mode is more clearly arranged and provided with explanations. always use this mode. personal experience: you can only _believe_ that or not: i use the software half a year once a week and never had any problems. on the contrary, as a non – techie, after the first scan/”cleaning”, i was finally able to delete 3 folders which were left over from earlier ad/spyware and could not be deleted before. and even other _really ancient traces_ (on my ancient laptop) of dubious apps appeared in the report after the scan and were finally deleted (and that, despite earlier use of ccleaner enhancer & co.). this is a complex program and so it has to be handled. but that’s relatively simple, because simply everything is listed and explained. you just have to open the eyes and let a little brain rule. something these “people” you mention, probably didn’t do. imho (again). select only the options where you are sure because of the descriptions and your intellect. for (a less drastic) example, i deactivate the firefox cookie-cleaning, as well as the deletion of the firefox indexeddb & dom storage. because i solve this via firefox itself. i don’t want an external program interfering with that. or there’ll be trouble for me. _and so on_. ps: and if you need to do it quickly (because privazer takes longer to do the jobs) but relatively superficially, which is often enough, use ccleaner portable parallel (imho after the previous steps described in the post) and always – with every single new build – be careful. it’s your choice. i don’t want to impose anything on anyone. it’s always my personal opinion, even if it sounds like i want to impose anything on anyone. everybody as he wants. _but_ : this “it’s shooting up my system” posts (from hearsay) can’t be left uncritically (because this app and the developer didn’t deserve that and only does unnecessary harm – whether intentionally or unintentionally i can’t judge because _i don’t know_ ; it’s the web). “avast” deserves that. because of their behavior over the last year .. and it doesn’t stop. with these new “split – auto – update – functions” (so even more options to opt – out, despite the firewall – blocking (because it is also about “principles”) only more possible back doors are left open to “phone home” if you believe in this “major update thing” ; including additional psychological tactics (“highly recomended” *lol*). everything “imho” (sorry, again). to be fair: other apps also act similarly. there is almost always a lot of necessary opt – out work and firewall blocking (and generally: “windows hardening”). but it is also about the “prehistory” of an app – ccleaner in particular. the beginning as the end: “most of the time ( = not always), the cause of the error sits behind the computer”. _in every possible sense, context, subcontext_. makes you really sick. ok, i switch to tutanota (or protonmail)… . and “standard notes”. and .. , and .. . it’s really a “non – techie – privacy – burnout”. and always find a “middle way” (what is not always possible in these times) – strenuous. back to something else and gladly again a simple reader of ghacks. like i always say, to hell with profit (and its cause). Okay. I get it. You use Privazer, and you’re happy with it. Let me correct something, though : the negative comments I referred to are not “hearsay”. They are actual bad (very bad) experiences reported by users. Bad experiences trump good ones. That’s what we see with Windows 10. A huge number of people have no problem at all with Windows 10. But that does not count. What counts is people experiencing problems. Also, summoning the old trope of “it’s the user fault” cuts no mustard. No, it’s not. This is either insulting (you can manage Privazer because you’re more intelligent than the stupid people who have problems with it), or it disregards the whole concept of a product needing to be safe, efficient and easy to use. That’s despite user errors, or, yes, possibly, users being stupid. There are many stupid people around, and they deserve good software, too. Also, intelligent people might not be as intelligent as they think they are. Usability and safety are not meant for “stupid” people only. “Intelligent” people need them very much, too. That being said, I have no personal opinion on Privazer either way. @clairvaux .. ok. as i wrote before : from hearsay. again. and without any traceable sources. just a statement. test it yourself (or not), otherwise everything you write is pure belief (for yourself), because nothing can be known just because you are reading something or getting it told. and these people themselves have probably screwed up. because _you can screw up easily_ if you “just press something”. brainless. overhasty. that’s what the described explanations in the app are all about. i gave you an example. more than in the last contribution is not more to contribute but please stop pulling this app into the mud. _that’s_ my point. and that was the point in the last post. i do not care if you use this app or not and i do not care if you like this app or not. but you’re doing unnecessary damage and i’m not gonna let that happen (uncommented). because there’s real effort and heart in this app – something that can hardly be found anymore (except in gorhills work and just a handful more). and it does its job and hasn’t done my system any harm in half a year’s use – exactly the opposite was the case (as described in the last post). the only weak spot: could be “thinned out” a little. yes. and if there really is a problem/possible bug, contact the developer, because bugs can never be excluded. right. but again: contact the developer and then – if the developer is customer/user friendly and wants to improve his “product” – he will find out if it is due to the app itself, _the user behind the system_, the system, another app, etc. . so it works. key word: github/others. so, if you want it to be quick and superficial .. you know the drill. no problem. use your ccleaner. i do too. with the utmost caution possible – only here contrast to privazer – utmost caution _in matters of privacy_ & co. .
the same applies here, especially to the first two apps: don’t just press around and then complain that something isn’t working anymore (i’m not talking about you personally, i’m talking in general) instead of (only) blaming the app, turn on the cortex and really deal with what’s in front of you _before_ you start any action & _before_ you start moaning about one of those apps. good night. i’ve really had enough of this – ultimately – pointless writing. “you” (again talking in general, including me) also have to be honest with yourself. tackle primary causes. and these have nothing to do with technology. it only emerges from this. I’m not commenting on either side of this particular debate, but wanted to point out that reporting something that someone else said is the very definition of “hearsay”. If you tell me of a problem you personally experienced, that’s not hearsay. If I tell someone else about your problem, that’s hearsay. However, this is pedantry that only really matters in a court of law. @Clairvaux your CCleaner program is a piece of bloatware. So unnecesary. I pity people who pay for it. CCleaner is not “my” program, nobody forces you to use it if you don’t like it, and you don’t strike me as the sort of man who pities others. How spiritually destitute can one be to pick a fight over a piece of code ? Seems to me any software one doesn’t find useful is de facto bloatware. After a decade or so of using CCleaner, as soon as they forced an update that resulted in pop-ups I uninstalled. I now use Bleachbit which is much faster too. I’ve used Glary in the past and it works fine as well. I use the portable version of 5.32 that Yulia, I think, linked to on ghacks a while back. Works fine on Win 10 v.1803. I blocked it in the firewall. Doesn’t install any tasks. Tried an earlier version, 49, maybe, and it wouldn’t open. The biggest issue with the newer versions released just prior to and during the piriform fiasco was they shut down after a few seconds if they were firewall blocked. If that behavior has been eliminated, new versions should be OK; blocked, of course. CCleaner has two great features: quick removal of MS store junkware apps and ability to delete all the stored, hidden cookies that ostensibly aren’t stored. “Clairvaux your CCleaner program” is a piece of bloatware. REALLY !!!!!! I have just run Task Manager. Ccleaner uses approx 6 (six) Megabytes of memory. That’s not bloatware. Engage your brain and check memory usage before you engage in a slanging match. It has been downloaded from Softpedia over 2,000,000 times. That’s a lot of downloads for a “Trash program”. Can you give your reasons for your sweeping statement? @ TJ .. of course privazer consumes more memory: _it works more thoroughly_. besides: there is nothing wrong with that. to define “bloatware” at the height of the memory is …. .
ps: downloading something from “softpedia” is already a very brave adventure. (trust the critical comments, not the advertising on wikipedia to “softpedia” itself). Softpedia is a trustworthy website and totally safe, stop talking nonsense please. and no, i won’t trust the irrelevant “Critical comments” most of which are from 2006. What I’d like from these type programs is an intelligent capability that knows what to remove without me choosing each entry, often among hundreds of results. I suppose an old version of ccleaner can still be used effectively with no so called telemetry i would assume. ?.Or are updates forced. I tried deleting the updated version and installing a much older version. After a week or so it auto-updated again (so now it is staying uninstalled). So it appears using an old version is not a solution. I never have. This sort of software has caused me so many headaches in the past that I just don’t use it at all — the benefits are smaller than the potential for damage. @anonymous .. you’re kidding me – auslogics? you’re kidding me – wise? eset detected after about 2 months “suspicious behavior” of their f… “software updater” and blocked it. yes i know, false positive … . no, not really trustworthy. in every way *lol*. I enjoy Chatting to trolls here. I”m a Troll Victim. Switched to Wise Care 365 already. I never quite understood why people use registry cleaners in the first place. CCleaner only removes entries in the HKEY_LOCAL_MACHINE hive and leaves the rest intact. Go search through HKEY_CURRENT_USER/Software hive and you’ll find the names of the folders belonging to the same set of programs you thought were gone forever littered about everywhere. In addition, if your intention is to save space bear in mind that when CCleaner runs it creates a System Restore point which costs you 300MB of disk space which kind of defeats the object of the exercise. I did not say that I use Softpedia. I happen to find that it is useful for checking how many downloads of a specific Program/Utility there have been. I use the download count as a rough guide to the usage and popularity of the software before I download from the official site. I have CCleaner, Privazer and Glary Utilities (portable versions) on my laptop. All “phone homes” are blocked in Windows Firewall using the Windows Firewall Control program. @T J : oh well, that’s ok – imho. but be careful with glary – software, despite “portable” and “firewall”. you know, the “eset experience” after 2 month with another glary – software. at least their stuff doesn’t get on my computer anymore. “false positive” or not. another choice, based on trust on eset (over something like glary). nice weekend. time to relax. “Kids, let me tell you a quick story.” No thanks. Your cleverness makes me green with envy. Sarcasm intended. Would you care to share the .bat file and add a link please ? Since the incidents happened I am using ‘Wise Disk Cleaner’.This is available for free and I am still happy with it. However, later I bought ‘Advanced System Care 12’ made by IO Bit for about 25 USD that offers more features. Both are regularly updated so I have no need for CC anymore. Using ccleaner 5.43.150.6520 and I blocked it from going online to get a new version or update. Really like it to clear my discs, but hate inquisitive, nosy people. The ccenhancer serves me very well. Downgraded to previous version 5.32 (around 9 months ago) before all the telemetry,spyware hassles and takeover. I have unticked the update boxes and deleted the update file within the CCleaner folder. And have had no problems since then. It still cleans as it was originally meant to. I wouldn’t dream of using CCleaner again, after it killed my Win7Enterprise system some years ago by being far too aggressive in its “cleaning”. And I keep getting the 50% discount screen when I use it. I keep adding a folder to delete in the options, and it keeps getting rid of anything I put in options. Got rid of CCleaner now using bleachbit. any idea where usage data are stored when you use Portable CCleaner?